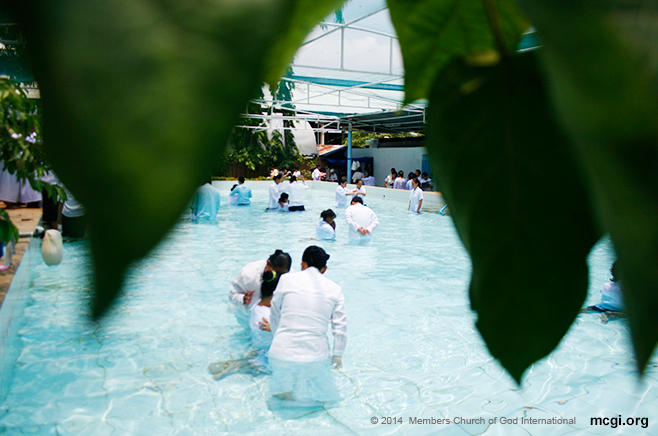 Read short testimonials of faith from some of MCGI’s youngest brethren baptized on November 14, 2014. Actually, I didn’t attend much in the Born Again group. Truth be told, I wasn’t active in any religion, but sometimes I just really watch television. I’ve known about The Old Path before. I first saw it on Channel 21. I just watched it before I went to sleep; I did nothing but listen to Bro. Eli. When you’re in the Born Again, you’ll get angry with Bro. Eli about the way he speaks. But as you keep on watching, you’ll know in yourself that what he says is true. I watched and watched the program, and that’s when I found out that it really was good. I researched it on the [Internet]; I googled it. Whatever thing I could find about it, I did, and it is perhaps through God’s mercy that He really wanted to call me that it just sprung in my heart and mind to undergo indoctrination, and now I’m here. Many thanks. I just went to the locale by myself; I asked around about it. I didn’t anymore investigated in the locale, only through television, because I really felt that [this is] the true faith from God and the true Church. Of course, I feel relieved. It’s like you’re fresh. You feel that you have truly repented of your sins in your heart. Also, when you get out of the water… I believe that other brethren felt what I also felt. It feels good. With the Lord’s mercy, may Bro. Eli be given a longer life that he may be able to lead many more lost souls to understand [God’s words]. It’s because his view is different from those of other religions. There is no religion like the Church of God. May they have good health as well. Many thanks Bro. Eli. [It is] because of the teachings and what Bro. Eli says are true. Also, I’ve been listening for a long time, but I was just afraid of joining then. But now I’ve decided to become a member. Every point Bro. Eli says has a basis in the Bible, unlike in other religions. Ever since my family became members here, I also stopped attending in Catholic masses. So I wasn’t attending anything; I only joined them at times. I feel happy. I’m glad. It’s like that. May the Lord continue to guide them that they may lead and help many more souls. Bro. Ronaldo: I have been attending Bible studies before in a Church in Makati as I worked there. They have doctrines that cannot be seen in their actions. I wasn’t comfortable with what I saw there. It’s unlike what I learned from Bro. Eli, which I got to watch on Youtube and on UNTV at our home. Comparing my experience there, I would say that I like better the teachings here. Also here, you feel that there’s a calling [that you respond to] with God’s mercy. Her family members are actually in the Church of God. Sis. Michelle: My mother and father have been in the Church for more than ten years now. Then, I became a single parent and had a baby. I then went abroad, and that’s when I really got to realize things. Bro. Ronaldo: We would argue about religion then. We were on Skype and we would say, “Why is your religion like that? That’s not right.” I would teach her with what I knew from the religion that I grew up in, that was fed to me by my parents whom I could not question. We accepted it not knowing that there is this. Sis. Michelle: Whenever we talked on Skype, I would say that, “Okay, let’s pray first.” Then, he would do the sign of the cross, and I wouldn’t. So he thought that I wasn’t serious or something. I’ve long been inactive in Catholicism, but I listen to Bro. Eli. Although I lived with my mother abroad, there would come a time when you would get homesick. Even if you got out… as they say, everything nice, sumptuous is there. But it’s only in the beginning. You will still look for something, someone who will complete you. Last December, I got home from Ireland. Then in August, we had a civil wedding. And since we began living as husband-and-wife, we decided that we should start attending to our faith. Sis. Michelle: Also, the graven images. He even always carried a rosary with him. Bro. Ronaldo: Even as I was driving, I would [carry] it with me. Bro. Ronaldo: I really got amazed with Bro. Eli in his debates. Sis. Michelle: It’s where you can see both sides. You’ll see their reasoning; you’ll see who is right and who is wrong. Bro. Ronaldo: Right. You can compare the different ideas. Bro. Ronaldo: I felt like crying. I wept so much, but I was controlling it. It felt light, as if a huge thorn was pulled off from my side. Like what Bro. Eli said before, that there are evil spirits. Me, I had demons inside. Instead of doing good, there would be a clash, and it was hard to bear. When we were eating, the one who assisted me said, “Happy spiritual birthday.” Now, I’m not afraid anymore. When I see temptations, they are not anymore difficult to avoid. It’s like in just one click they all disappeared in my mind. I don’t anymore curse, as I was a regular curser before. I used to smoke cigarettes; I was a drunkard. With God’s mercy, I have ceased such acts. Sis. Michelle: I felt very light. Since I got out of the water, I felt like I wasn’t me. When I was eating, that’s when I realized that I had already been baptized. I followed whatever instruction was given me; I went with the flow of things. I felt like my mind was floating. Then when I sat here, now baptized, I felt like it was the end of a journey that started ten years ago. This is very shallow for me to say, but I’m afraid of water. “Won’t I drown there?” I asked myself. But then, I didn’t even feel it. I just felt very light until I got of the water. As I walked, I felt like everything around me was white. Sis. Michelle: I hope healthwise, Bro. Eli will improve because there are really many more souls that need to be helped. Especially, with God’s mercy, the way he explains is different. May he be given more bodily strength by God; both of them, him and Bro. Daniel. Bro. Ronaldo: The same with me. Bro. Eli, thanks for your teachings. I learned the true doctrines of God because of your teaching us. I would not be able to set myself straight as the father of my house. We’re going to start a life like this, so I’m thankful. Be healthy always. Many more people need you. Bro. Joseph: The real reason is we have long been looking for a religion that will truly satisfy our beliefs. I’m from Catholicism and now, I read of and heard something from Bro. Eli that there are verses in the Bible that says, “Thou shalt not worship idols.” So I had second thoughts in me as to why Catholicism is like that. Sis. Shema: I was also a Catholic before, but my father listened to Bro. Eli. He obliges us to listen until the time came when I got curious about it. Then, I would sit with him and listen. However when I got into college, it kind of got out of my system. Now that we are married, it feels like it was what was lacking in us. It’s that thing that is lacking no matter how much success he has achieved in work. You can buy anything you wish, but then there’s something missing. Until the time came when we had a child, and I thought, “How will our son be? What will we teach him, when we ourselves are not sure of ourselves.” Also, we were facing tragedies. Bro. Joseph: Actually, I’ve been in a car accident, thrice, and they were with me for the two times it happened. Our child was with us when the car flipped over in June, and none of us had any seatbelt on. But because his work schedule was hectic, we delayed, and got into an accident again at NLEX. The vehicle in front of us suddenly stopped. It was only minor, but the nerve-wracking feeling returned to me. Bro. Joseph: Whenever I’m with my family, that’s when misfortune strikes. And I was asking, “Why?” One time, I was with my sibling from abroad, and together with [his wife] was their only child. The first time we got into an accident, the car toppled over. I thought nothing of it as we were all okay; we got through it safely. I told myself that something is missing. But then, I couldn’t find it in Catholicsm. Every time I went to mass, the teachings they say is the same old thing. What you heard in January, when you return, you’ll hear it again. Only the sermon of the priest varies. Sis. Shema: It’s like you’ll assess why you go there in the first place when you won’t get anything from it. Bro. Joseph: That’s why we couldn’t invite our son there. Sis. Shema: We couldn’t teach him. Bro. Joseph: It’s like your having second thoughts on whether you’re going to say this to your child or not. So what we just did was just to pray at night feeling that it would somehow suffice, but it doesn’t. Bro. Joseph: I was in Iloilo then. Bro. Joseph: He couldn’t read what Church it was, but he said that there were many people in it. My son is just three years old. Bro. Joseph: Actually I was really crying. 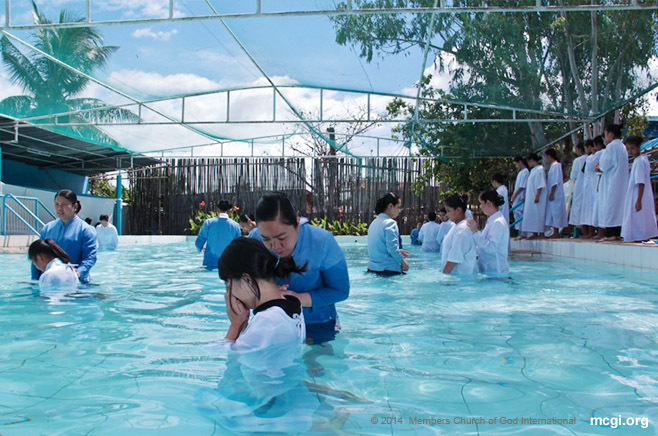 When [the baptizer] was aking me questions… I didn’t feel that feeling in any other religion, wherein you really feel sorry for all that you have done. It’s like there is this one grievous feeling that you just dumped all at once. 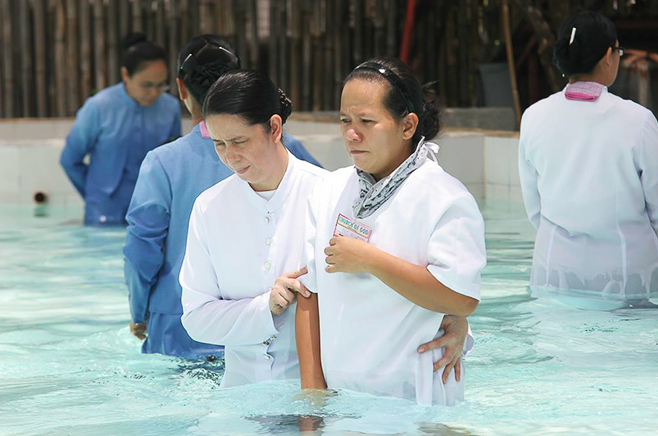 While walking towards [the baptism area], I was afraid thinking, “What would happen to me?” However afterwards, I felt light. There were many hindrances. Like for example, this day that we had to travel far, the car is in the repair shop. Then, the deadine of our projects at work is due Monday, so I was supposed to work overtime. But then, our head boss visited the office and I got the chance to ask permission to leave work. Even in our town, they are not accustomed to seeing me like this [points to attire]. The whole barrio would throw banters at me as I walked. I just replied, “Why?” In my mind, I was thinking, “I can very much do this because this is for God.” But actually, they have learned to appreciate it. They said, “You look more beautiful in that attire,” something like that. Thanks be to God. At first, I felt like crying as I thought of all your sins. However when I got out of the water, I felt very light. I felt that my heart was aching due to the overflow of emotions, but I’m okay now. Bro. Joseph: Bro. Eli, Bro. Daniel, I hope that you’ll be able to touch many more hearts to be saved. I really feel that the end is near now so what you’re doing is really needed, touching many countries so at least many will be saved. I hope you will not tire and continue the work that you do. May your lives be longer, and from this day, we are one with you in service to God. We will do everyhing we can to somehow help you win our fellowmen’s hearts [with God’s help]. Sis. Shema: And may we serve as lights to our families as well that they may also be encouraged to turn back to God.